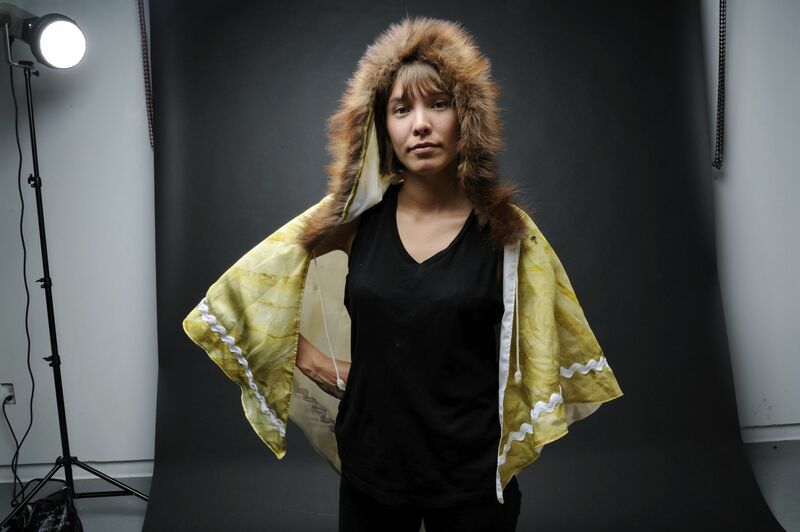 Two members of our Aboriginal ECU community have been longlisted for the 2018 Sobey Art Award, the preeminent prize for Canadian artists 40 and under. Celebrating some of this country’s most exciting young artists, the award provides significant financial and professional recognition. And this year, the Award has doubled — with a top prize of $100,000 issued to the winner and $25,000 to each of the four finalists. The remaining longlisted artists will each receive $2,000. The finalists – one from each region in Canada – will be announced on May 29.Past award recipients include ECU alumni Jeremy Shaw, Brian Jungen, and Nadia Myre. 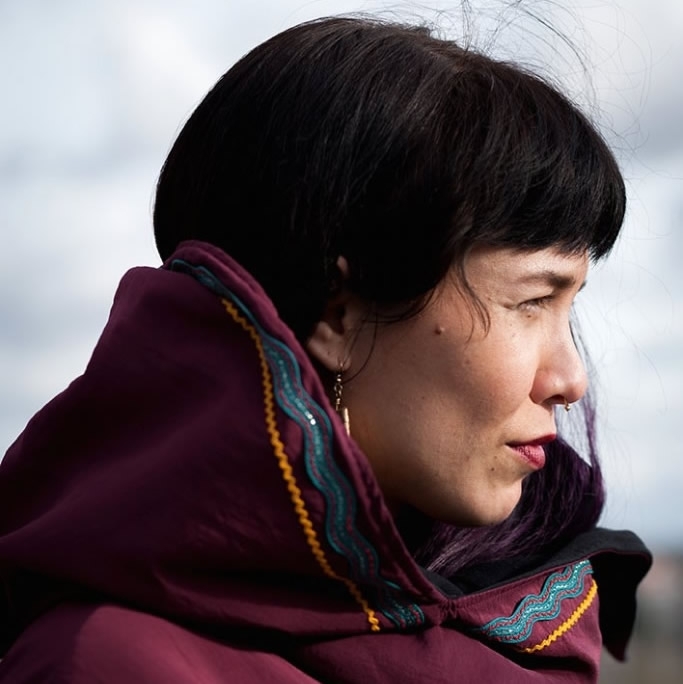 Jeneen Frei Njootli is an artist (Vuntut Gwitchin) and co-creator of the ReMatriate Collective, who has been living and working as an uninvited guest on unceded Musqueam, Squamish, Sto:lo and Tsleil­Waututh territories for a decade. In her interdisciplinary practice, she uses media such as performance, sound, textiles, collaboration and workshops. 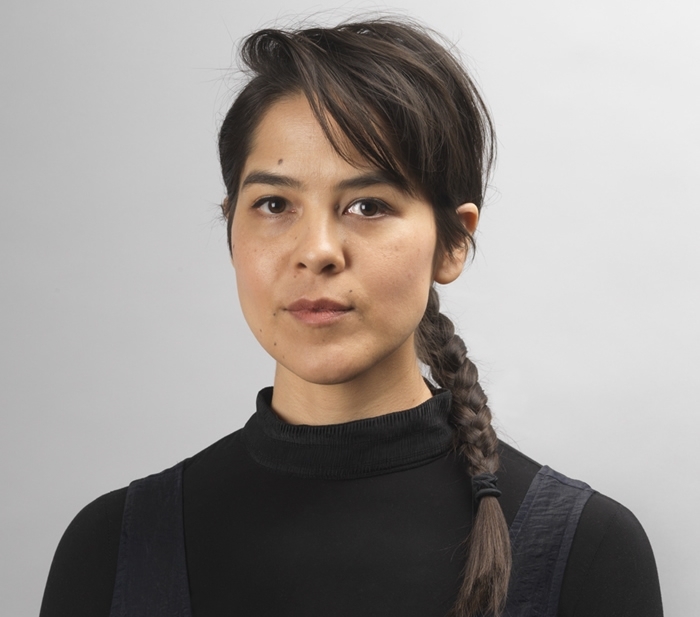 For her recent Media Arts Residency at the Western Front in Vancouver, she hosted a free workshop on how to create and update Wikipedia pages for Indigenous women artists. In 2017, Frei Njootli was the recipient of the Contemporary Art Society Vancouver Artist Prize, and in 2016, she won the William and Meredith Saunderson Prize for Emerging Artists. After graduating from Emily Carr University of Art + Design in 2012, Frei Njootli completed her MFA at University of British Columbia in 2017. Krista Belle Stewart’s work engages with the complexities of archival material through processes that allow for both intimacy and coincidence, as well as for the atemporal meeting of actors across time. Working with video, photography, design, ephemera and textiles, Stewart straddles the gaps between personal and institutional histories through transparent mediation. Her work has been exhibited at the Museum of Contemporary Art, Montreal; Plug In ICA, Winnipeg; House of World Cultures, Berlin; International Studio and Curatorial Program, New York; Mercer Union, Toronto; Vancouver Art Gallery, Contemporary Art Gallery, Artspeak, and Western Front, Vancouver; and Esker Foundation, Calgary. Born in Kamloops, Stewart is a member of the Upper Nicola Band of the Okanagan Nation and lives and works in Vancouver. She holds a BFA from Emily Carr University of Art + Design and an MFA from Bard College. Salmon Going Up River (Scháyilhen) immediately invokes a sense of urgency, of struggle, of passion. Questions arise: is it about the journey, the destination, the mission, or is the motive of greatest significance? Is failure an option? Twelve Indigenous artists have been gathered to address the notion of Salmon Going Up River. From Danielle Bobier’s inorganic grid-lines and circular pools evocative of the built environment in Catchment Area (2017) routed from salvaged mahogany plywood; to Shain Jackson’s twenty-foot natural and painted red cedar with abalone inlay Legacy salmon sculpture; and collections of found objects as in Jay Haven’s Bargain Hunter made from bags gathered from retail stores on reserves throughout British Columbia—themes and stories begin to unravel. Within a climate of reconciliation, the metaphor of Salmon Going Up River speaks about remembering, of going home—it’s about the future and of survival. It is directional, of going forward by way of the past. Yet, the past at best serves as a guidepost. The journey is arduous and painful, fraught with seemingly impossible barriers demanding multiple attempts to overcome—bruises and battle scars added at each rung. Fight we must, but with each other? Is the river and its many obstacles not battle enough? There are resting pools along the way—so easy to linger; to set up residence. 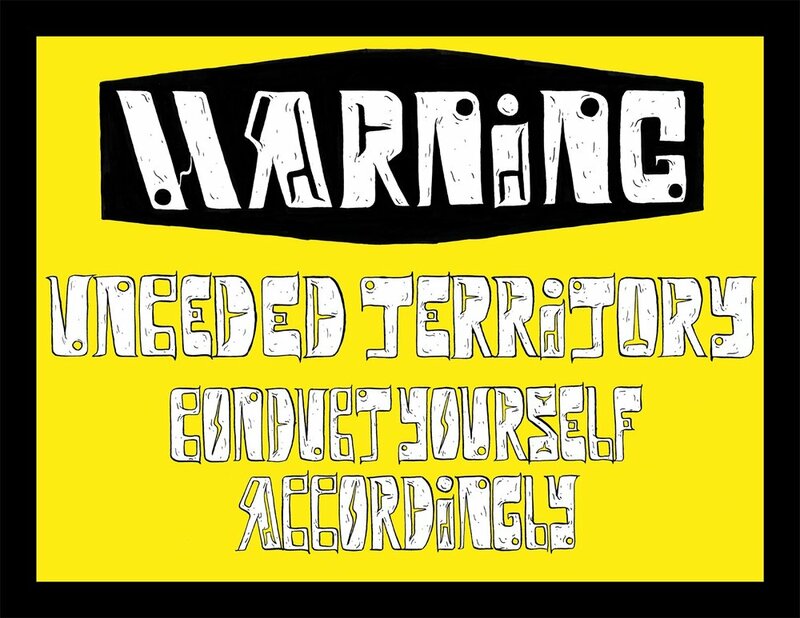 Complacency threatens. And so the conversation begins. 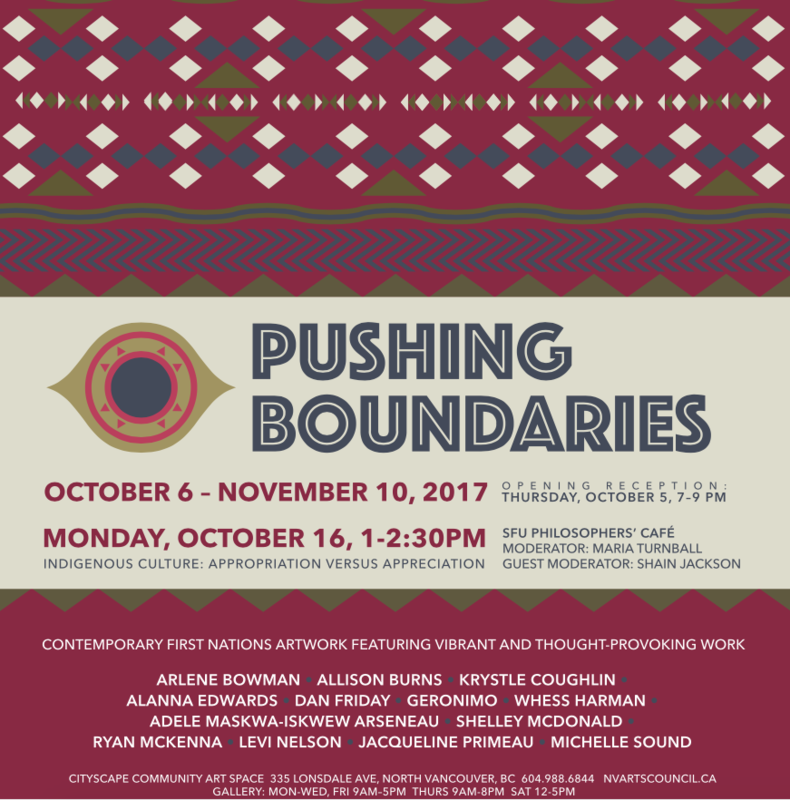 This biennial exhibition showcases and celebrates contemporary local, national and international First Nations artists. 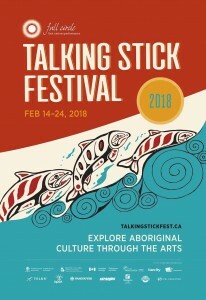 Through carvings, portraiture drawings, digital images, textile work, video and more, themes of family, reconciliation, indigenous life, gender, race, politics and nature are explored. Emily Carr University is pleased to share news of alumnus + Assistant Professor Raymond Boisjoly’s selection as one of four international finalists for the 2017 Aimia | AGO Photography Prize, marking the 10th anniversary of Canada’s most significant award for photography. Co-presented by Aimia, the Canadian global leader in data-driven marketing and loyalty analytics, and the Art Gallery of Ontario (AGO), the Prize awards $50,000 to a winner selected by public vote. The four finalists will present their work in an exhibition opening September 6, 2017 at the AGO in Toronto. Voting begins in person at the AGO after the exhibition opens and on the Prize’s website beginning on September. 13, 2017. 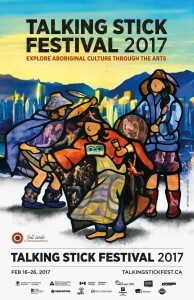 Raymond Boisjoly is an Indigenous artist of Haida and Québécois descent who lives and works in Vancouver. He has exhibited extensively across Canada and internationally in both solo and group exhibitions. Boisjoly investigates the ways images, objects, materials and language continue to define Indigenous art and artists, with particular attention to colonial contexts. 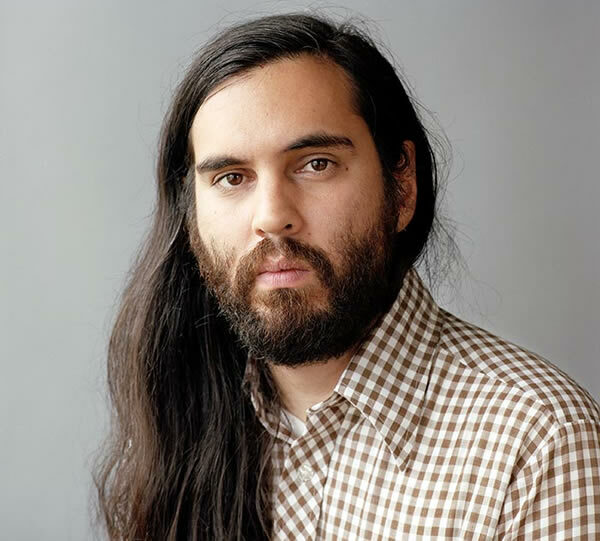 In 2016, he was a recipient of the VIVA Award, presented by the Jack and Doris Shadbolt Foundation for the Visual Arts in Vancouver, and is one of five artists shortlisted for the 2017 Sobey Art Award. Boisjoly is an Assistant Professor of Interdisciplinary Studio in the Audain Faculty of Art at Emily Carr University of Art and Design. He is represented by Catriona Jeffries Gallery. The Sobey Art Foundation and the National Gallery of Canada today announced the longlist of nominees for the 2017 Sobey Art Award. 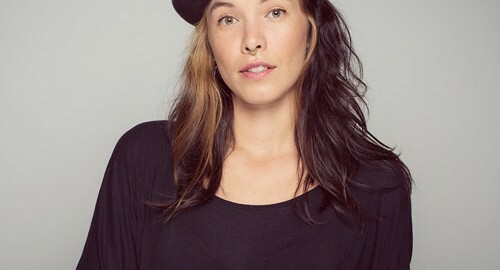 The Sobey Art Award is presented annually to a Canadian artist aged 40 and under who has exhibited in a public or commercial art gallery within 18 months of being nominated. These 25 longlisted artists—five for each of five regions—are vying are for the top prize worth $50,000. Each of four other finalists will receive $10,000. A related shortlist of five artists will be released on June 6, with the top winner of the prize being announced on October 25 in Toronto. Congratulations to our Aboriginal Alumni on the longlist! Jeneen Frei Njootli is a Vuntut Gwich’in artist and a founding member of the ReMatriate Collective. In her interdisciplinary practice she uses media such as performance, sound and textiles. Much of her work deconstructs the history of the materials she uses. 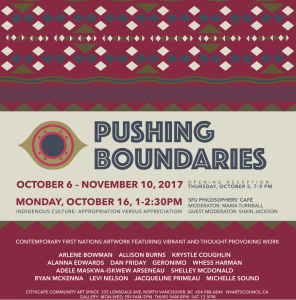 She investigates their relationship to trade, ceremonial regalia, and the politics of First Nations art. Her work is now in the Vancouver Art Gallery’s permanent collection. Raymond Boisjoly is an Indigenous artist of Haida and Québécois descent who lives and works in Vancouver. His work investigates technology, Aboriginal identity, the relationship between text and image as well as the limits of the visible. He is an Assistant Professor in the Audain Faculty of Art at Emily Carr University of Art + Design. Several Emily Carr alumni and faculty will soon be receiving an award unlike any seen before in Canada. Created by the Hnatyshyn Foundation, the REVEAL Indigenous Art Awards are intended to honour emerging and established Indigenous artists and to fuel future Indigenous arts practice. Recipients will each receive a one-time award of $10,000. Of the 150 artists selected, eight are Emily Carr alumni and faculty. The recipients were chosen by a national jury of peers and include visual artists, media artists, craftspeople, musicians, writers, storytellers, dancers and actors. The winners will receive their awards on May 22 at a special ceremony in Winnipeg that will include National Chief Perry Bellegarde, Winnipeg mayor Brian Bowman and Canada Council CEO Simon Brault. Join us in congratulating Sonny Assu (2002), Liz Carter (current student), Thirza Cuthand (2005), Mark Igloliorte (Assistant Professor, Faculty of Visual Art + Material Practice), Mary Longman (1989), Nadia Myre (1997), Janice Toulouse (1979 and Sessional Faculty) and Niki Watts (2016). Find out more about the REVEAL Indigenous Art Awards here. Cover Image: Decolonial Gesture or Doing it Wrong? Refair le chemin, 2016. Nadia Myre. Levi Nelson, and Michelle Sound. Beginning with a welcome by Musqueam artist and knowledge keeper Debra Sparrow and concluding with a spoken word performance by Nuu-chah-nulth/Kwakwaka’wakw poet Valeen Jules, the afternoon features talks by notable cultural figures involved in Indigenous art: art historian Charlotte Townsend Gault, Nuu-chah-nulth historian, poet and artist Ron Hamilton (Ki-Ke-In), Kwakwaka’wakw artist, activist and scholar Marianne Nicolson, and Cree curator and scholar Richard Hill, Canada Research Chair at Emily Carr University of Art and Design. 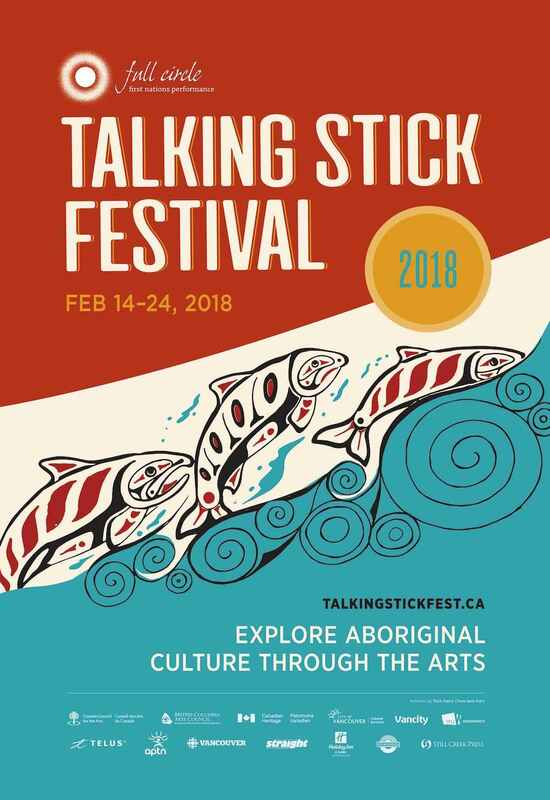 In addition, a lively discussion between Vancouver Indigenous scholars, curators and artists – Lindsay Lachance, Jordan Wilson, Jeneen Frei Nijootli and Jennifer Kramer – promises to be a highlight.